Video Blog Post Production | Rewatchable, Inc.
Just last week we attended HubSpot’s Inbound13 event in Boston. We were glad to see that marketers from around the world are starting to get the idea that content matters. Fresh blog posts allow marketers to introduce new concepts and engage with customers. One of the things we noticed at the conference is there is an entire industry that is helping companies write up content for blog posts. Why? Because writing blog posts can be difficult and time consuming. The trouble is these outside blog post writers are not actual subject matter experts. We think an easier way to create content is to create Video Blog Posts. At Rewatchable, we often produce sophisticated videos that require a good deal of planning and a ton of editing. A video blog post does not need to be nearly as time-consuming and expensive as a traditional corporate video. Website visitors often just want to hear directly from a subject matter expert and don’t need all the bells and whistles of a traditional corporate video. We just happened to stumble upon a good video blog post that probably wasn’t that difficult to produce. However, it provides valuable information for website visitors and increases the credibility of the HR Solutions Company, PI Worldwide. 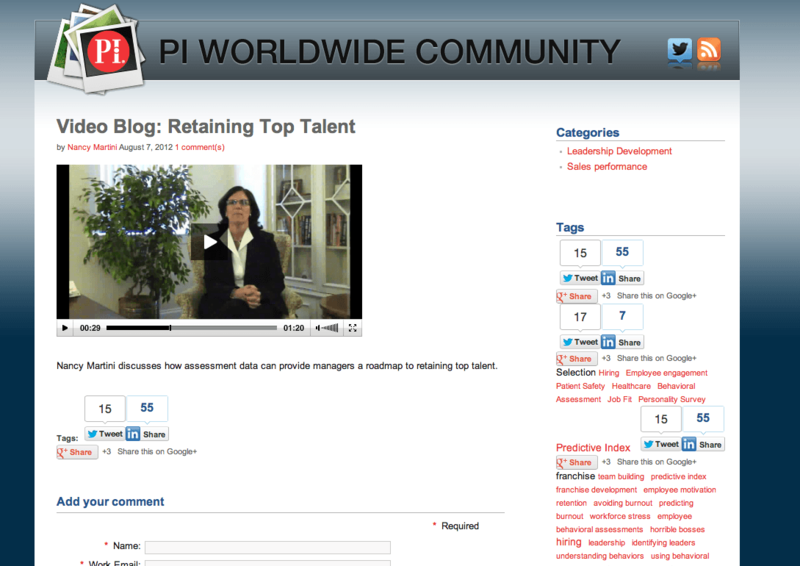 Anyone who watches the video would walk away with a better understanding of the importance of employee retention and would look at PI Worldwide as an HR expert. Of course, that is way more powerful than an outsourced, text-based blog post could ever be. In addition to providing great content for blog visitors, video blog posts also can be easily transcribed so they are search engine friendly and will drive traffic from keywords searches on Google, Bing etc. Rewatchable is a Boston Videography Company.